I bought Tisca in January 1997. I didn't really intend to buy him - in fact he was almost the opposite to what I had decided I wanted. 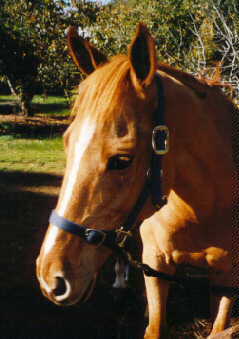 I sold my first(disasterous) horse in November 1996 and had lost my nerve. I meant to buy an older (over 10), experienced horse that had done a little bit of everything, to help regain my confidence. After months of searching, and lots of nice horses that just didn't 'click' with me, I found Tisca. 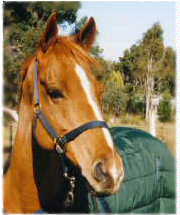 He was advertised in the Sunday paper - 8 years old, chestnut, thoroughbred gelding. That was all it really said - and 'good temperament'. I phoned the owners up and talked to them about their horse. They didn't know a lot except that the horse had raced and hadn't done a lot since. I actually said to the guy on the phone 'Look, I really don't think this is what I'm looking for...' - but immediately he replied, 'My Dad reckons he's the best horse he's ever owned' - and that convinced me to have a look. My Dad and I drove down to look at Tisca. The only reason I had phoned up was as it was a local number, the day before we'd travelled for literally hours in the car searching for horses that cost 4 times as much as Tisca. But even though he was too young, too inexperienced and worryingly cheap - we looked at him. The property was an absolute dump. Broken down fences and rubbish all over the paddock. Tisca (who at the time had no name) didn't look a lot better. He was covered in scabs and bite marks and was very underweight. He was standing in his shelter when I first looked at him, and Dad expected me to turn around and leave. Later he said he didn't understand why I bothered to even ride him, but there was something about Tisca that appealed to me - he had decent conformation and more importantly this wonderful kind, beautiful eye. He hadn't been ridden in nine months and yet when his owners hopped on (a bikie) he immediately pointed him at a 2'9" log which he flew over. I rode him and fell in love. 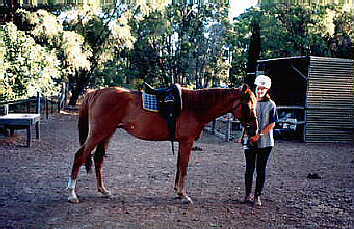 We came back that afternoon with my instructor, rode him again, bought him and took him home. Just like that! Tisca wasn't in good shape when I brought him home. We had my vet out to look at him and he was put onto a course of drugs to help Tisca become healthy again. As you can see in the photo above, and this smaller pic, Tisca was far from looking good - and these photos are an improvement on his original condition. Right from the start Tisca was perfect to handle, to float, shoe, give injections too and catch. And at first he was an angel to ride as well, although all I did was walk quietly for weeks. We named him the day we got him home, as I was told his racing name was Natisca Rain. My Dad shortened this to Tisca, which suits him perfectly. Later I discovered his real name was Nakiska Reign, and that he was only seven, rather than eight. Throughout that first year Tisca had two major accidents, including damaging the muscles surround his stifle joint (he was in such a state of shock that putting him down was a very real option) and a bad kick to his hock. I only had irregular lessons with Tisca at first, and paid the consequences for over estimating my ability. Soon Tisca was bucking (I was thrown off twice), rearing and trying to bolt. I began riding him less and less as I rapidly became scared of him. The final straw came when he reared up while I lunged him, pulling his bridle off, and charged straight at me. He swerved and galloped around the paddock. By the time I caught him I was in tears and beginning to compose For Sale ads. That was in late 1997. That night I phoned up a lady I had just decided to have lessons with (who I'd never met) in tears, wanting to cancel my lesson as my horse was 'mad'. Fortunately Chris convinced me to let her come over and help, and that was the beginning of a huge turning point in Tisca and my partnership. I never considered selling him again. Chris soon realised that Tisca needed me to be relaxed and confident so he could be. By concentrating on me and getting me to forget about Tisca I began to relax and so did Tisca. It took months to regain some of my confidence, I actually didn't ride him for a month during my TEE (Tertiary Entrance Exams) as the possibility of me being hurt and unable to sit my final high school exams was pretty high. 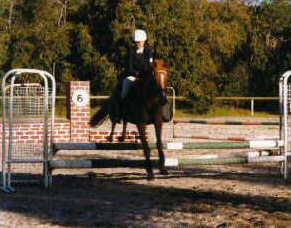 By February 1998 I was becoming more confident and Tisca was ready for his first show. I have a very detailed (be warned!) of my shows from then until now here . I joined Kelmscott Pony Club soon after and began to show regularly. I found my university timetable (as well as my driver's licence) allowed me to ride almost every day and we improved rapidly. I competed in small showjumping events, as well as the occasional ODE.We did relatively well, placing in most classes, but we stuck to smallish (up to 2'9") classes as I'm not really cut out for huge jumps! Pony Club was fun after Tisca became used to the situation and calmed down. We had a few minor difficulties over the year including two bolts (both partly my fault) and a few relapses on my part to nervousness. By the end of the year I was ready to move on, although I still appreciate so much the help that Chris and her daughters gave me over the year. I still ride at their property very often and it was due to them that I was able to acheive me goal of competing at the Kelmscott Agricultural show in October 1998. (Photo on left taken at the show grounds). In late December 1998 I began lessons with Wendy Barker. I had decided to concentrate on the dressage phase of eventing, as this was where I was losing important marks. Within a few weeks my focus had changed from eventing to dressage, and now I am absolutely fascinated. We attended some hack shows early in 1999, doing quite well, and later began competing in dressage and Preliminary and Novice level. At present dressage is still new, but both Tisca and I seem much better suited to it than to eventing, and surprisingly Tisca appears to be quite talented. Who would have thought when I bought the skinny little gelding two years ago he would turn out to have a 'big trot' and a 'wonderful canter' (quotes from two Prix St. Georges riders). We are consistantly scoring above 60% at Preliminary level, although our Novice scores are not so good. We have competed at both Pony Club and Open competition, and I hope to start Official EFA classes next year. This year Tisca has improved in leaps and bounds. I always knew he was special, but now other people are beginning to see it as well. He still has his quirks - he's impossible to keep fat, his coat rubs on anything (reins, chaps etc etc) and he has to be doped up to his eyeballs to be clipped. But he still has that wonderful kind eye that caught my attention, and I love him to pieces. I'm hoping that we, as a 'super future combination' (comment from my last test) can continue to progress and acheive to the best of our abilities.